Haven't felt much like swatching lately, but I took some bottle pics of some pretty stuff! Some Ulta brand polishes that were buy two, get two free (isn't that really just buy one get one free?). I forgot the name of the purple one. Material Girl, Envy (yes, envy, not just one but two Ulta green shimmers with envy in the name!) and... Jaded? I must admit I liked the old bottles better because these square caps don't align properly after you open them. Some of the new Finger Paints. I think the multi-colored glitter in the middle of the top picture is limited edition but the rest are permanent! How cool is that?! I couldn't find the one that's supposed to be an Absolutely Alice clone, I'll have to hit another Sally sometime. I think it's awesome that they've added a whole bunch of greens and glitters to their permanent collection. And of course, the crown jewel... The Ulta Glam Goth collection. This picture kinda turned out weird. But these are awesome. Sure, they're all really similar to other polishes, but they're just so awesome all together like this. Thanks for the pretties to look at. Can't wait to see them swatched. Hope you feel better soon...these are lovely! Why is it that I am attracted to dark colours once summer hits? Is it because I am wearing brights?? Hauls are so much fun!! Oooh look at all the pretties! I love bottle pics too. nice! i just picked up the glam goth set last night, too. 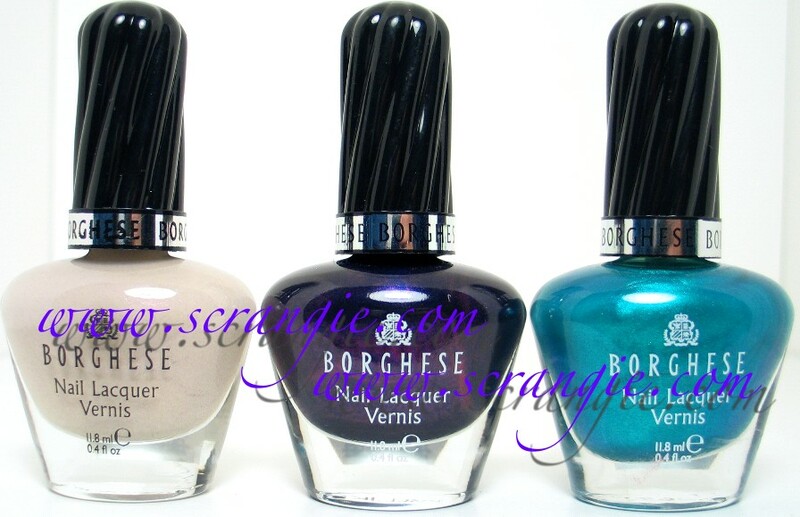 my ulta did not have borghese on sale though. hope you feel better soon! Those ULTA bottles have pull-off caps with a smaller cap underneath like Chanels do and so if they get misaligned you can just pull them off and realign them. That annoyed me about them as well until I figured out the trick. 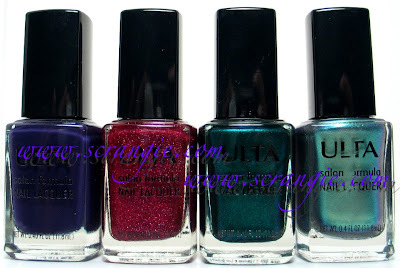 Can't wait to see them swatched...especially the Ulta polishes. I picked up Envy and Jaded a little while back, they are just gorgeous. About the cap thing, the square bit is just a little cover over a round handle, so it's easily fixed if you can get it loosened. What are the names of the green fingerpaints polishes? I can't wait to see those swatched! the teal with gold shimmers in the ulta glam goth set is pretty unique, i wish they sold it full size!! The supposed Absolutely Alice clone isn't like AA at all, but it IS a super-cool blue jelly with holo glitter, so worth tracking down if you can! I went looking for hidden treasure today, because of your recommendation....and SCORE...I got the last bottle in the first Walgreens I went in...beautiful. Hi Scrangie - What is the name of the dark blue Finger Paints in the picture with 3 bottles? I must have this color!!! Thanks in advance. I have the Finger Paints blue holo jelly. I forgot the name and I let my friend borrow it so I can't look it up. I bought it because I thought it was an Absolutely Alice dup, but it's totally not. Personally, I like it much better. It's super sheer, but if you don't cheat by putting a blue underneath and actually take the time to get good coverage (like five to seven coats, no kidding), it has this amazing depth to it. I don't like AA because it always chips on me on the first day. All OPI glitter polishes do. I have no idea why. They don't meld well with Orly Bonder? Anyways, the Finger Paint mani lasted all week. Seriously amazing. The "Absolutely Alice" dupe is called Sapphire Shimmer for those who were curious. The multicolor one is called Wicked Glitter. I LOVE both colors. Especially Wicked Glitter. Also have all the FP greens..and most of the new colors they came out with. One advantage to working at a certain beauty supply store that carries said colors. Speaking of polishes you never see mentioned, have you ever used the Heaven brand polishes? I have one that is absolutely my favorite red EVER- it's a red glitter that is so intense that it looks like Dorothy's ruby slippers- the real ones! The brand is Heaven Nail Lacquer, the color is HNB51 - RUBY. It is so freaking insane that I can't stop looking at my nails when I wear it. It's seriously amazing, and cost a grand total of $2 at Albertson's! Kendra: They are in order, Sketch N Etch, Scenery Greenery and Tough Art To Follow. The last one I think is Art of Theft.